Sometimes the kids and I pair random things together. This activity is one of those examples. It's an odd combination for sure, but ultimately, it was cool, engaging, and the boys had a blast with it. 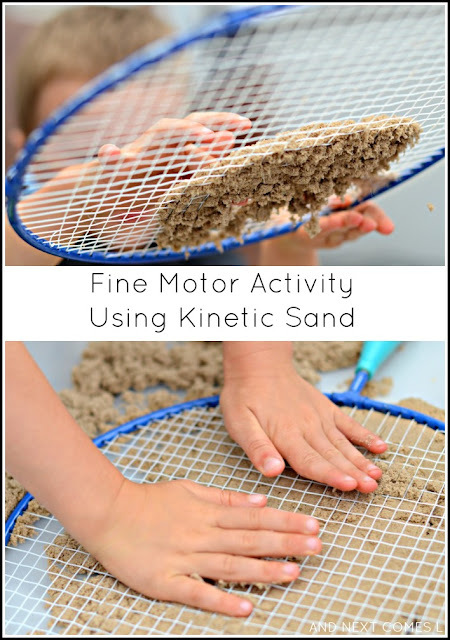 So yes, we paired a large badminton racket with kinetic sand for a really quick, no prep fine motor sensory activity. 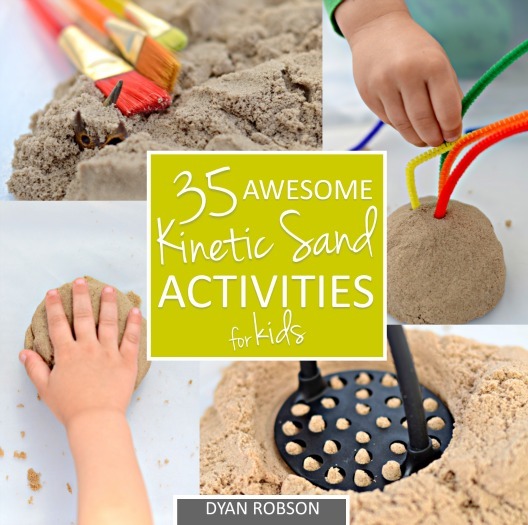 The boys were playing with some kinetic sand in a sensory bin out in our sunroom. A lot of outdoor toys are strewn around the floor in the sunroom, one of which is a large badminton racket for kids. J picked it up and started using it to smack the kinetic sand. So I asked him a question, "What happens when you press the racket down on the kinetic sand?" He used the racket to stamp the kinetic sand and it left a really neat grid pattern. Then J started experimenting with pushing the kinetic sand through the badminton racket. This part was fun! Pushing the kinetic sand through the racket is great for working on fine motor skills, but it also creates cute little blocks of kinetic sand. It's also really neat to watch the sand fall through the racket while they poked at it. Random, but simple. Odd, but fun.